The US State Department had ordered non-emergency government staff and family members of government employees to leave Democratic Republic of Congo a week before a presidential election. After two years of setbacks, broken promises and delays, the Democratic Republic of Congo has started campaigns for the long-delayed Dec. 23 poll. Voters on December 23 will choose a successor to outgoing President Joseph Kabila, who has constitutionally remained in power as caretaker leader after his second and final elected term ended nearly two years ago. Washington in an e-mailed advisory to citizens, said that it had “limited ability to provide emergency services” to US citizens located outside Kinshasa, especially in the east and the central Kasai provinces. A fire in capital Kinshasa last week destroyed thousands of voting machine and ballot boxes. Other western countries have advised their citizens against travelling to Congo, while the UN human rights chief on Friday called on Congolese authorities to halt violence ahead of the election. 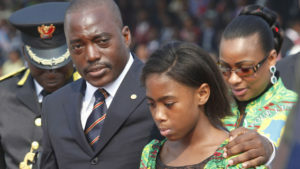 Twenty-one candidates are vying to replace the 47-year-old Kabila, who has ruled since January 2001, after his father, President Laurent-Desire Kabila, was assassinated. Former DRC Interior Minister Emmanuel Ramazani was nominated as a majority candidate by President Joseph Kabila on August 8. The electoral board is standing by its decision to use 106,000 touchscreen electronic voting machines supplied by South Korea, despite some opposition demands for paper ballots. Posted by Geraldine Boechat on December 17, 2018. Filed under News. You can follow any responses to this entry through the RSS 2.0. Both comments and pings are currently closed.